Known as Snap Frames, Clip Frames and Grip Frames, our frames snap open at the front edging for super quick poster changing. Our range includes Standard Silver Snap Frames, Waterproof Sealed Poster Frame Counter Top Opti Frames, Black Clip Frames, Vandal and Tamper Resistant Snap Frames, Shiny Gold and Shiny Silver Poster Frames, Silver and Black Snap Frames. Our Clip Frame range includes an extensive selection of sizes and various profiles. 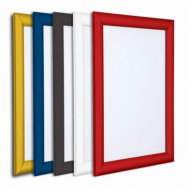 Our wall mounted Snap Frames are manufactured in aluminium, with a 1.5mm rigid styrene back panel. Your poster is protected by a sheet of anti-glare UV grade PVC and our stock snap frames are individually boxed. Select from a wide variety of frames. They are premium quality at low prices. You can also select from our range by colour. Orders are delivered the following working day. Our stock snap frames are individually boxed. We also supply Bespoke and Custom Snap Frames.